o Regardless of table size, we typically use just four dining room chairs. This defines the dining area, but doesn’t crowd the space for pictures or showings. o Rugs are a popular ingredient for space definition, especially in open concept layouts. Rugs can add color or texture to the space, while also complimenting the dining room furniture, art and home style. Avoid dark tones or busy patterns. o Not using your formal dining room for dining right now? We often encounter these spaces being used for offices, extra sitting areas or even a class room for home schoolers. Please – transform it back to a dining space when selling so buyers easily understand how to use this key space. Doesn’t a table set for gatherings make you feel all warm and happy inside? Yes, it just feels like home – exactly what we want potential buyers to experience. 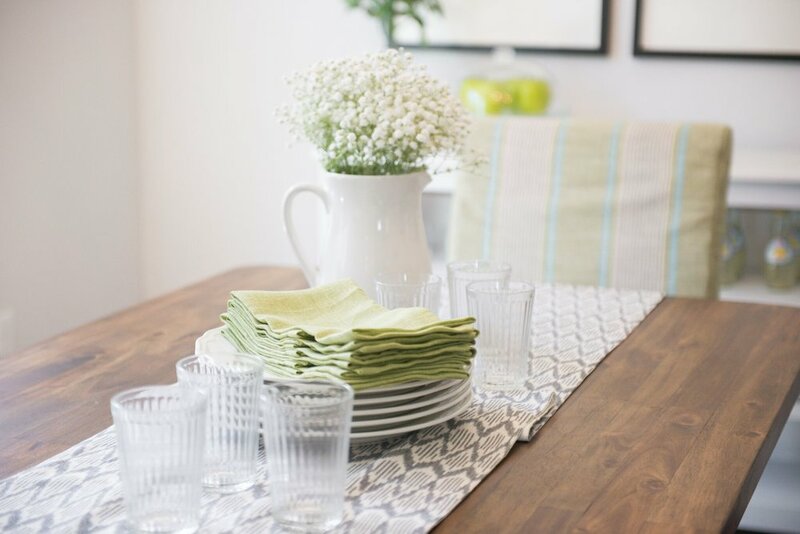 We always recommend adorning your table with a neutral runner, and don’t be afraid to pull out your fine china. No china? No worries - you can use every day dishes. Simple, light-colored plates work best. Be sure to add cloth napkins (plain or with a pop of color), and don’t forget the votive candles and glasses! To create interest and drama, we suggest not doing a fussy table, formally set. Casual and comfortable work best for “dinner is sold” tables. And the final touch -- fresh flowers or greenery. 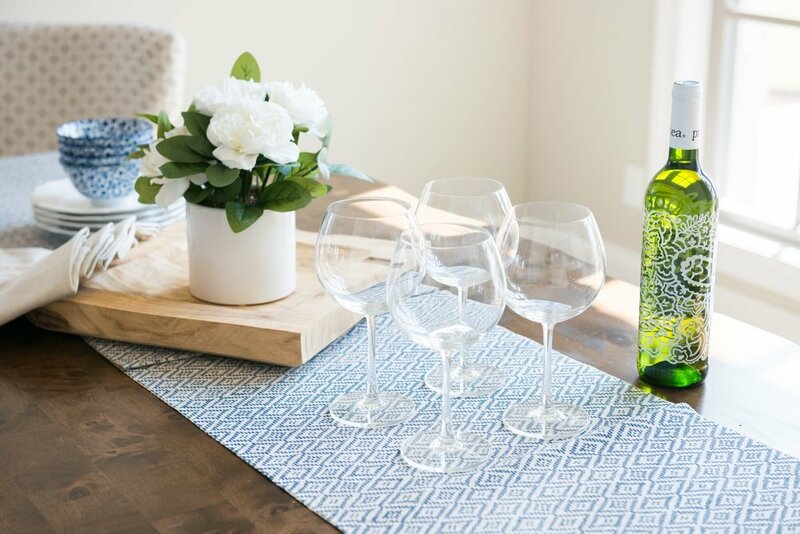 You can style with a pretty glass vase, on-trend basket, tall beverage pitcher or sweet mason jar. If you decide to use fresh flowers, make sure to keep them seasonal, ideally just one color and don’t forget to change the water every few days. Greenery can be anything from a fresh bouquet of herbs to a blooming plant, shiny jade plant or other live succulents. If you are on a budget, you’d be surprised at the hidden treasures you’ll find within your own cupboards for vases, centerpieces, platters, vintage dishes and more. Greens can easily be sourced from your yard. Snip a few stems from your garden and put them in a pretty vase with water. And voila – you’ve just “set the sale” for a welcoming table! The House Dressings team looks forward to gathering around our own festive tables this Christmas season to pray and give thanks for the abundant blessings of 2018. Our hearts are filled with gratitude for the Lord’s great provision in our personal lives and for our amazing staging partnerships this year. We’re excited to share some example images of “Staged Happy” dining spaces! Bon Appetit!